Playing and Learning With Play-Doh Is Fun For Everyone! There are plenty of ways to play with play-doh. 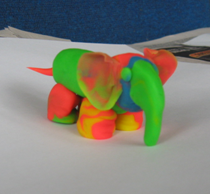 Explore this website to find out the new and exciting things you can do with play-doh. You can learn how to make animals. Play a different version of pictionary. Simply enter your name and email address in the box below and when you are done click on "Submit", and I will see you on the next page! Read about "A Mother's Play-Doh Story."